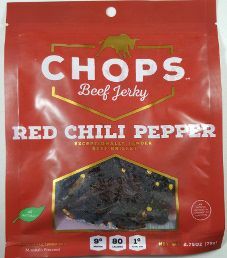 The next review on Chops Beef Jerky will be on a 2.75 ounce/79 gram bag of their red chili pepper flavored beef jerky. This red chili pepper flavor is described as being packed with heat, and game for even the most diehard of spice lovers. The jerky bag was kindly submitted for review by the Head of Digital, Carole Gervasi. 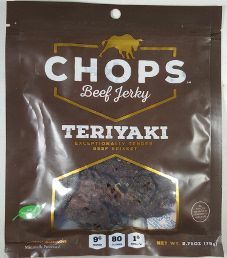 The next review on Chops Beef Jerky will focus on a 2.75 ounce/79 gram bag of their teriyaki flavored beef jerky. 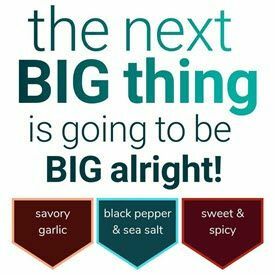 This teriyaki flavor is described as a tangy alternative to the original flavor, with some added dimension to the ingredients, which results in a familiar, yet altogether new experience for consumers. The jerky bag was kindly submitted for review by the Head of Digital, Carole Gervasi. 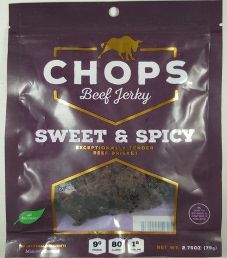 The next review on Chops Beef Jerky will be on a 2.75 ounce/79 gram bag of their sweet & spicy flavored beef brisket jerky. This sweet & spicy flavor is described as the perfect balance between sweet pineapple and lemon juice with a kick from the chili peppers. The jerky bag was graciously submitted for review by the Head of Digital, Carole Gervasi. 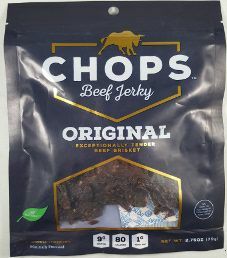 The first review on Chops Beef Jerky will focus on a 2.75 ounce/79 gram bag of their original flavored beef jerky. This original flavor is described as having slight overtones of freshly ground black pepper, with a small hint of brown sugar culminating in an unrivaled and unbeatable wholly unique flavor. The jerky bag was kindly submitted for review by the Head of Digital, Carole Gervasi. The next review for BeefJerky.Rocks! 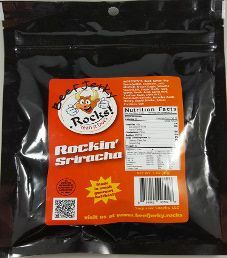 will focus on a 3 ounce/85 gram bag of their Rockin’ Sriracha flavored beef jerky. This flavor is described as a uniquely spicy jerky that slowly creeps up on you. The jerky was graciously submitted for review by the owner, James Sokol.